1 Why did my Vitamix shut off? If you have an Ascent or Venturist model, it will display error code E31 or E3x when the thermal override activates. This post will explore what causes motor heating and describe how to minimize it. I investigated by directly measuring the temperature of the motor in a variety of blending conditions. Why should you avoid overheating the motor? If the thermal override trips, you cannot run the Vitamix until it cools, which can take 20–60 minutes. If you’re in the middle of making something, the interruption is a hassle. Keeping the motor cooler should prolong its life. Occasionally overheating the motor is fine, but if you do it regularly, it puts more wear and tear on the motor. Why did my Vitamix shut off? Thick blends can overheat the motor. It will shut itself off before it burns out, and it will not let you turn it on until it cools down. To avoid overheating, don’t blend more than 4 cups of thick blends like hummus, nut butter, or ice cream. When blending thick ingredients, run at maximum speed. If the motor does overheat, you can use it again sooner by blowing air into the vents with a fan or hairdryer (on cold!). Some people speed cooling by putting the Vitamix base in the fridge, but, if you leave it in too long, you could run into condensation issues when you take it out. The rest of this post will explain factors that contribute to motor heating, why fast speeds are helpful, and a special motor-cooling trick. Thicker blends slow down the motor (see my speed measurement page for more details). This is why the motor sound has a lower pitch when blending thick things. The motor is cooled by air blown by a fan on the bottom of the drive shaft, and the fan spins at the same speed as the motor. You can see how a thick blend increases the chances of overheating: the motor heats more and has less cooling. For more information about the type of motors used in Vitamix machines, look up universal motors. You don’t need to obsess about these factors—just keep them in mind. The motor is most likely to overheat when multiple factors act together. Thickness of blend (thicker = more heat). Quantity of blend (more volume = more heat). Blending time (longer time = more heat). You can get away with blending something really thick for a short time, but if you blend it for extended periods, it will overheat the motor. 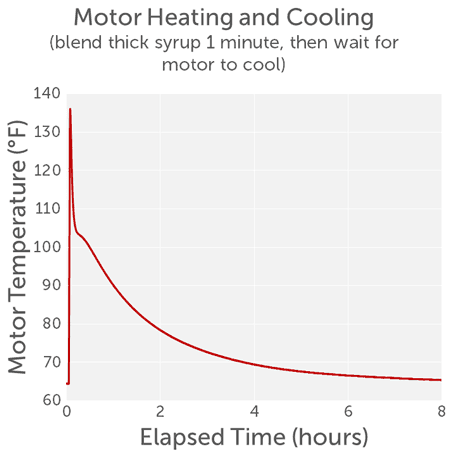 Similarly, if you make one recipe after another, the motor can be more likely to overheat, because it didn’t fully cool between uses. Temperature of environment (hotter environment = less cooling by air) so you have to be more aware in the summer or if the kitchen is hot from a lot of baking. Tip: Blending too long at too low of a speed setting will overheat the machine and cause the Automatic Overload Protection to turn off the machine. 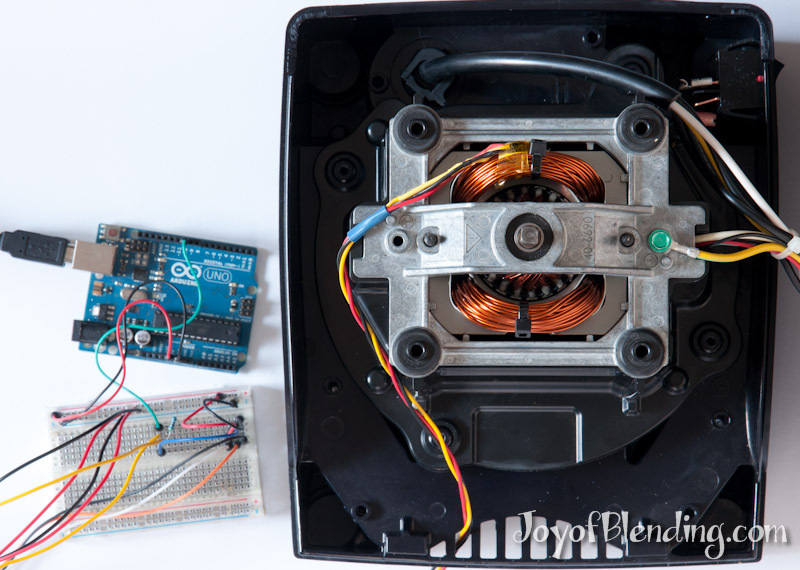 Blending on higher speed maximizes the motor’s cooling fan to avoid overheating. 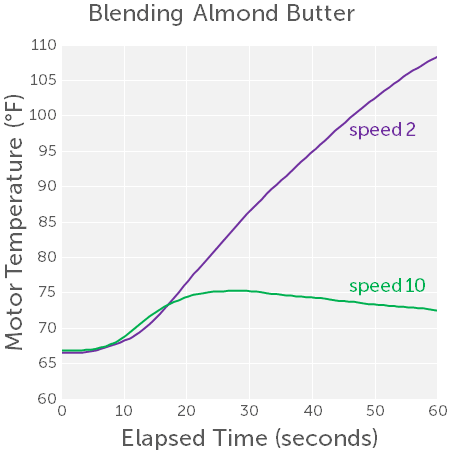 Vitamix’s speed recommendation is counterintuitive, and it’s what inspired me to investigate. I decided to measure the temperature of the motor windings. I opened up the 7500 base, stuck a temperature sensor to the stationary windings using thermal transfer tape, and ran a wire out an air vent so I could continuously monitor temperature. I attached a small temperature probe to the motor stator with thermally-conductive double-sided tape, plus temperature-resistant tape over it to be on the safe side. I ran the wire out an air vent and recorded temperature over time using an Arduino. I made a batch of 8 cups of thick syrup (similar to what I used for my horsepower measurement) to get a high load that would be consistent. One thing to watch out for with syrup is that its viscosity changes significantly with temperature, and it heats up during blending. But as long as you keep this in mind, you can ensure the syrup temperature is consistent across comparisons. I wondered if lower speeds would heat more due to the slower cooling fan, which would explain Vitamix’s high speed blending recommendation. So I made a series of measurements comparing motor heating at high and low speed. However, for a given load, high speed always heated the motor faster than lower speeds. 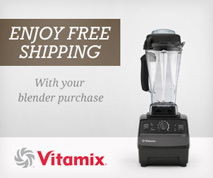 This seems contrary to Vitamix’s recommendation! At first I thought maybe I wasn’t seeing the lower speeds heat more because the motor was too close to room temperature. (The greater the temperature difference between motor and air, the greater the cooling advantage of higher speeds.) So I made measurements at elevated motor temperatures, but again saw the same thing: high speed heated the motor more than low speed. This means that the lower electric current at lower speeds more than compensates for the slower cooling fan. Then I realized that in most actual thick blending situations, the Vitamix does not run against a constant load. When making hummus or nut butter, the motor encounters a high load, and then the blades often form an air pocket. In the air pocket the blades encounter almost no resistance. Then you collapse the air pocket with the tamper, so the motor ends up going between high and low loads. This is the answer to the paradox of why high speed keeps the motor cooler. At high speed the blade is more likely to form air pockets, which allow the blade to intermittently spin at low load, which keeps it much cooler. (You can tell when the motor forms an air pocket because the sound changes to a high pitch whine.) There’s also a secondary aspect, which is that at high speed the motor will be able to finish the blending task faster, so it’s on for a shorter time. The use of air pockets to cool the motor is a feature of Vitamix blenders that I didn’t know about until now. (The formation of an air pocket is not a problem because Vitamix machines come with a tamper that lets you collapse it without needing to stop the motor.) Now I’m wondering if Vitamix engineers designed the blades to form the air pocket for this purpose. 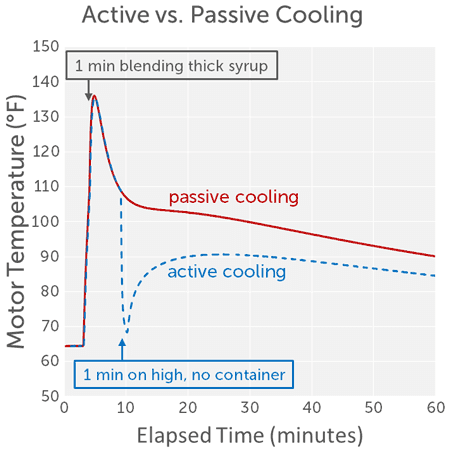 In this case, 1 minute of no-load blending cools the motor as much as waiting ~30 minutes without running. You can see the temperature quickly drops almost all the way to room temperature when running without the container. It increases after the motor stops because the thermometer measures the surface temperature of the windings. The temperature increase comes from conduction from the hotter internal windings. One thing to watch out for is that the thermal override sensor also sits on the surface of the windings. So if you use this trick and immediately resume super heavy blending past the overheat temperature, the thermal override will be a bit delayed, and the motor could go above the ideal temperature cutoff. It shouldn’t be a problem if you wait a few minutes after the no container blend, or if you’re blending something only moderately thick. Also, if you use the trick preemptively, you can prevent the motor from getting close to the overheat temperature. Thick blends cause blender motors to work harder, which makes them more likely to overheat. If you understand the basics of what’s going on, you can make thick blends without overheating. Running the motor at maximum speed reduces the chances of overheating by shortening blending time, and by periodically forming an air pocket around the blades, which allows the motor to efficiently cool itself. There’s one other thing I learned from these measurements: you don’t have to be paranoid about totally avoiding low speeds for thick blends—low speed will usually only be a problem if you leave it blending for extended periods over ~1 minute. 1. Interestingly, the heat conduction properties of air are not significantly sensitive to humidity. I have a Super 5000, which is 12 years old. I love it, but while using it the other day, the top got bumped hard and it had made a “zing” metal noise, as I instantly grabbed the container, picking it up while motor was running…..all within a second. I turned it off, and put the container back on. It would not start, even he next day. No burning smell! I thought the gears got stripped, but both turn manually, same as before. It’s like the on/off switch doesn’t work! Any help is appreciated! Does the motor make any noise when you turn it on? If yes, an easy drive socket replacement would probably fix it. If it stays totally silent, then it would need to be repaired by someone who can open it up and test the various components. No noise at all! Thanks for your help.